Illustration courtesy of Gamo, Inc. When you enter the world of air rifles most folks are overwhelmed by the variety of models within each brand, not to mention the price range. To put things into a bit of perspective, let's look at some general characteristics. Most air rifles range in weight from 5 pounds to 8.5 pounds, with velocities ranging from 600 - 1450 fps and prices from $65 to $1,600. No, that isn't a misprint, a top end Beeman air rifle sells for $1,600 bucks and change. If you are going to be a competitive shooter, there is no question that you would spring for the Beeman. However, for the rest of us, who simply want an air gun for plinking and small game hunting, you don't need to drain your bank account to get a good one. Gamo is the largest producer of airguns in the world and have been in the business of making them since the 1950's. They now distribute their products in over fifty countries. With that kind of production and distribution, we decided that, even though Jim and I are high-power rifle shooters, that it might be fun to try an air rifle. The Bone Collector Bull Whisper is a gas piston (IGT, Inert Gas Technology) break barrel gun. Thanks to the IGT, the air gun has more velocity and does not have the vibration that other spring rifles make. The fluted, polymer jacketed steel barrel of the Bull Whisper reduces the noise characteristic of most air rifles by more than 50%. This is a very positive feature for folks living in communities that have an aversion to noise, not to mention the advantage when hunting squirrels. The Bone Collector comes in .177 and .22 caliber. We decided on the 0.177" for its higher velocity, upwards of 1,300 fps with PBA Platinum pellets. After a month of waiting, the rifle finally arrived. The Bone Collector Bull Whisper is better looking than most air rifles and the synthetic stock does not detract from its appearance. In fact, knowing that we were going to take it into some very unfriendly country with lots of rocks and fallen trees, a tough polymer stock will be more advantageous for us; no worries about dings, chips or scratches. Not wanting to wait for a day at the range, we took it out back and set up a target in front of our barn. We quickly determined that, like most rifles, it does not like all brands or weights of pellets. The Gamo PBA Platinum pellets weighing 5.2 grains shot very well at 25 yards and easily penetrated the 3/8" wafer board backing our target. Hence, we switched to 1/2" board to prevent any more holes in the barn. The 6.8 grain Gamo PBA copper-plated pellets were all over the paper. They simply would not group. However, at the slower velocities out of our future son-in-law's air pistol, they were incredibly accurate. He now has a good supply of these for his plinking. We picked up a tin of Gamo 7.9 grain Red Fire hunting pellets at our local sporting goods store and tried them. These were just what the doctor ordered. Not only did they group well at 25 yards, but penetration into the wafer board backstop was excellent. There is no question that these pellets and the PBA Platinum are more than adequate for the smallest game and varmints. I know that some folks have taken wild pigs and coyotes with the Bone Collector Bull Whisper and other air guns; however, just because you can do something once, doesn't mean that you should. A well placed .22 LR will take down an elk, but it is unsportsmanlike like, more likely to wound the animal, instead of resulting in a clean kill. As with all air rifles, the wind is a major factor when it comes to hitting the target. Anything above the lightest breeze will adversely affect your accuracy past 10 yards. 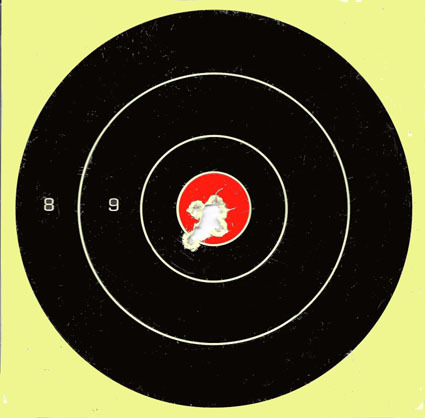 However, on a calm afternoon, Jim was able to put eight Platinum pellets into the bullseye at 25 yards. He obtained similar results with the Gamo Red Fire pellets. Final conclusion, the Bone Collector Bull Whisper, in the hands of an experienced shooter is a "tack driver." 25 yard target with Gamo PBA Platinum pellets. Although the SAT (smooth action trigger) isn't target rifle quality, it is more than adequate for plinking. Out of the box, it had a 4 pound pull. After turning the adjustment screw to the minimum pull weight setting, we got the pull down to 3.25 pounds. The two stage trigger is relatively crisp, but could be improved if Gamo were to replace the plastic blade with one made of steel. The Bone Collector Bull Whisper has an MSRP of $289.95, which is a very reasonable price for a quality air rifle. We both recommend this as a fun gun to shoot which is more than adequate for small game. You could spend more or spend less and still wouldn't have an air gun as nice as the Bone Collector. We are looking forward to hunting squirrels with it in the fall and any prairie dogs that happen to venture into our back pasture (their holes are hazardous to our horses). Copyright 2012, 2016 by Mary Clary and/or chuckhawks.com. All rights reserved.